Any child would agree that getting a new toy is about the coolest thing that can happen. It means a day filled with fun while you get to know the brand spanking new toy that's getting added to your growing collection. Parents on the other hand, are not very enthused. For them, a new trinket for their child means a day filled with attempting to put the darn thing together. Not to mention, spending at least a half hour just trying to get the toy out of the box. However, Hatchimals are a new breed of toy. Hatchimals bust themselves out of their packaging because they're independent toys that mom and dad will love for this very reason. 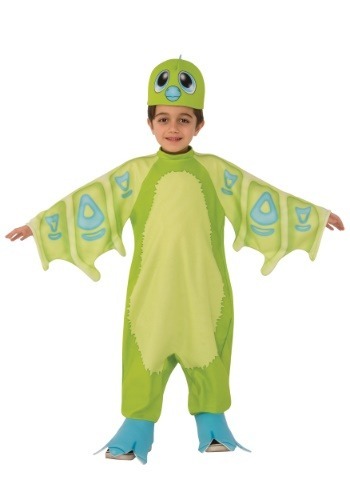 This Hatchimals Draggles costume for toddlers is much like the actual interactive toy. Parents don't have to spend lots of time fiddling with this costume or desperately trying to pry it from the packaging. Plus, this costume will keep your little one occupied for hours, much like the toy. This costume will transform little Hatchimals lovers into an actual Draggle. The comfortable green jumpsuit is printed to look like the curious magical creature, complete with wings and a light green belly patch. Blue shoe covers are attached to the jumpsuit to cover your toddler's shoes, while the headpiece features the happy face of an adorable Draggle. You'll love watching your little one doing whatever a Draggle does while they're flapping around the room. Check out all of our Hatchimal costumes for toddlers so your little one can collect them all!